I want to share with you today a book that I have read a couple of times over the last year. It has absolutely nothing to do with trading… but then again it could have everything to do with your results from trading. Any of you that have read the blog for any amount of time will know that I am into my meditation and that I’m quite a spiritual soul. I’m not religious in anyway though, but I do respect anyone that is. It’s just not my thing personally. But whatever your life stance, the book I’m about to tell you about today really might open up some new pathways for you and take the pressure out of searching for success. I have waited until the beginning of the year to tell you about this book so that you could read it now and see how your life unfolds over the year. Have you ever stopped to listen to your own self talk? If you have, then my hat is off to you. If you haven’t then you’re probably in for a right shock. We all do it from time to time, the moments when we realise we are prattling on to ourselves… but do you really analyse any of your self talk at all? If you have or do, you’ll start to realise what an absolute beast our own minds can really be to us. That’s why i wanted to give you my Untethered Soul Review. I knew that was going to happen, should have bought the other course, this course is to advanced for me…I remember when I was dancing I knew the same… I’m hungry, what time is it now? I really don’t like that guy; she didn’t say hi to me either… I have to go get the kids… that trade was ridiculous, can only get better though… my legs are sore… what’s on TV tonight. Sounds crazy doesn’t it. It almost is. But each and every thought leads to another and another and creates a different emotion within us. The amount of time we spend talking to ourselves like this is unbelievable. For most people it is most of the day. Some people will then go on and carry that bad trade from our example around with them all day. This non stop thinking helps create more and more painful thoughts regarding the losing trade, but then creates more and more negative thoughts in general. This type of thinking can easily lead to all sorts of stress… and it’s easy to see how. Trading can be a very emotional and stressful way to try and make a living. But imagine if you could get control of your thoughts and emotions and start to be the boss of your own trading mind? Imagine if you could learn to cut out most of the noise in your life and step back and just look at all the thoughts non-judgmentally? Imagine how easier trading might become? Or imagine losing the fear to lose so that you can become a better trader? The fear that your mind is creating from thoughts… not facts. Imagine being able to apply the same technique to any other area of your life and gain control of your excessive thinking? Do you thing your life might be better? Imagine starting to fear less and live more? That is what The Untethered Soul is all about. It’s about help you realise that you are nothing more than the witness to all the thoughts that your mind creates. And for me, it has really been an eye opener. It Takes Time but is Soooo Worth it. Now this isn’t a quick fix that is going to happen over night. But it is something that you can learn to do and use to enhance your life over a few weeks and months. It isn’t complicated, voodoo, religious, scary, trash talk, a cult or any other type of thing that you won’t agree with. It’s just about how you can start to gain control of your life and stop your negative self talk by just taking a back seat and watching it all go on. I found this concept to be very liberating. Along with my regular meditation [something that you do not need to do to make use of the book] I have found a way to say ‘be quiet brain’. The name of the book might sound a bit new age and hippy for some, but I assure you that anyone and everyone could learn something about themselves from reading it. If you don’t like the sound of the title, then that’s fine, but don’t let that put you off. You might regret it. 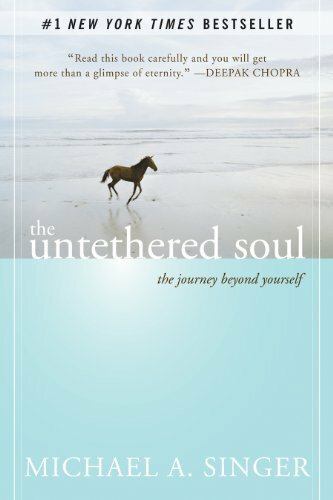 You can take a look here on Amazon and read some of the Untethered Soul review. I really have enjoyed this book and just had to share it with you.